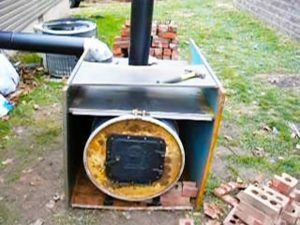 This video shows the build of a redneck style off grid wood burning heat exchange we use to heat our house in the winter. It will keep your home warm without electricity, or using the furnace. The air comes in through the front, where there is a lot of spaces along the bottom of the barrel, then gets heated and rises through the duct in to the house.Here,the air from the house does not go into the exchanger, it only pushes warm air into the house.